Free Family Name ... What a terrific item to organize you home. We will personalize with your family name free. All important information in one place, from appliance model and serial numbers to the colors of paint, wallpaper, flooring, drapes, window coverings, and important information that can be listed for each room. This terrific organizer puts all your important documents and information in one convenient place. Truly a must to help keep your life and home organized. You will wonder how you ever mananged without this unique item. Bunco LLC has developed this customized Home Profile™ for the Bunco enthusiasts. Home Profile ™ comes personalized with Family Name on the cover making it the perfect Family Organizer for many occasions. 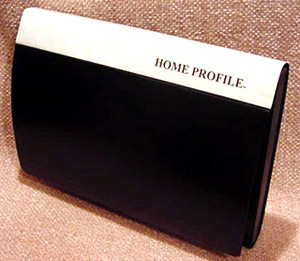 The “Home Profile™” can be the keeper of your latest project or your important documents for your Family. Home Profile™ will help you get organized and help eliminate the stress in your life. Lauren Rylee of Action Tracers recommends creating a written document detailing the following, and leaving it with a spouse, or with a trusted friend if the family is traveling together. • Information such as Guardianship papers etc. Medical information for a baby sitter. It was recommended to place an envelope with childrens medical card and contact information. for the Doctor, Hospital and names and numbers of other people you would want contacted in case of an emergency. If you are leaving in a hurry … grab the envelope you prepared out of your Home Profile ™ and give to the babysitter.